One of my labors of love returns later this week. The Southern Illinois Men's Expo evolved from the Southern Illinois Men's Conference which first debuted in 2009. The year before a group of men came together and started working on a conference under the guidance of Women for Health and Wellness, Inc. That group had a Women's Conference and Teen Women's Conference that had been around for years prior to the inception of the men's event. In 2016 we decided to drop the conference angle and give it an expo feel. The event relocated to Black Diamond Harley Davidson's Entertainment Center. 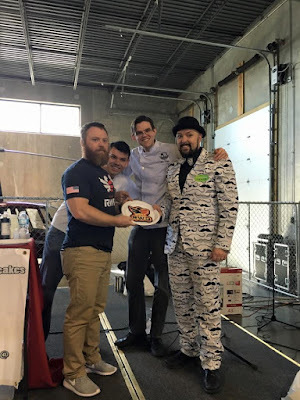 We had Dr. Dan the Pancake Man on the main stage. There was grilling info, beer to sample, pushup challenges, drones, doctors on call and a panel discussion on fitness and nutrition. There was also life-saving blood draws, health screenings and fitness tests all for $15. This year we're changing things up again. Yes, all the screenings and health aspects are sticking around. But in 2017 the event is absolutely free. Our main event speaker is Southern Illinois Miners COO and manager Mike Pinto. He'll talk about taking charge of your health. Doug Brinkley of the SI Brewers will have a demo on making beer, while Dr. Jeff Ripperda will discuss the health benefits of beer (there really are some). Haute Wheels Food Truck will be selling lunch that day. Some vendors and exhibitors will have items for sale too, that's the only money you'll spend. Again, admission is free so enjoy the day with us. Come at 7 a.m. for the fasted blood draw and stick around for a day of fun activities and events.